CEDIA is an international trade organisation with over 3,700 members who design, manufacture and install technology for the home. Founded in the USA in 1989 with a vision to serve the home-technology market, The Association acts as the go-to home technology source for consumers and professionals alike. CEDIA is a central hub for members, providing industry-leading educational courses, training and certification whilst serving as a powerful networking resource to help support member companies grow and provide exceptional service to their customers. The annual CEDIA EXPO is the leading industry trade show, showcasing the latest in connect home technology. Taking place in San Diego, California, the show brings together more than 20,000 home technology professionals and 500 exhibitors for five days of networking, CEDIA certified training and exciting product launches. What is expected of CEDIA members? CEDIA members are governed by a strict code of ethics which strives for overall excellence and responsible business practice in the industry. Members must adhere to the code, which measures quality of service, responsiveness, correct legal and ethical conduct to remain part of the CEDIA community. Industry professionals can also attain a CEDIA certification, which involves passing a technical exam, in order to promote their excellent level of skill and knowledge within the home technology profession. How long have avp group been members of CEDIA? 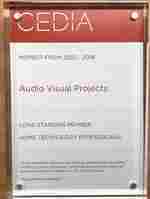 avp group have been members of CEDIA since 2002. As a result, we have achieved ‘Long Standing Member’ status. “Our CEDIA membership is of great importance to us as a business.” says avp Group Director, Jes Culley. “It provides us with great insight into the latest developments in smart home technology and offers a great training resource for the whole team to ensure we keep delivering industry-leading solutions and maintain our high standards of customer care”. What are the benefits of being a CEDIA member? Being part of the CEDIA community allows us to connect with like-minded businesses and home technology professionals. Through the network we have been fortunate enough to forge established relationships with specialist partners to deliver extraordinary smart technology projects. Working with CEDIA manufacturer members, architects, builders and interior designers gives us peace of mind and enables us to deliver projects of outstanding quality for our clients.